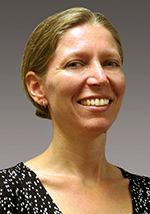 Congratulations to Dr. Stephanie Waldhoff, who co-authored a Perspective article in the December 5 issue of Science. The journal, published by the American Association for the Advancement of Science, is a widely read and respected publication for science research and opinion. The Perspective is an invited opinion article written about topics and issues of concern and interest to a broad community. Waldhoff and colleagues wrote "Using and improving the social cost of carbon," concerning a key economic tool used in U.S. government regulatory impact analyses. Climate change alters more than temperature. It affects human lives and businesses. The Social Cost of Carbon is an economic measurement of those impacts. It is used in cost-benefit analyses for all federal regulations to estimate the economic impacts of changes in carbon emissions. Waldhoff and her colleagues advocate for a uniform, scientific process to review and update this measurement. Waldhoff is a research economist at the Joint Global Change Research Institute, a partnership between PNNL and the University of Maryland. She works on integrated assessment modeling and climate change impacts. Prior to her position at PNNL, she was an economist for the Environmental Protection Agency where she focused on the economic damages from climate change impacts. Waldhoff has a Ph.D. in public policy from the University of Chicago. Read a summary of the Perspective article or the full text.